Careers | Calfrac Well Services Ltd.
Calfrac is a leading independent global provider of specialized oilfield services with operations in Canada, the United States, Latin America and Russia. Our service lines include hydraulic fracturing, coiled tubing, cementing and other well stimulation services designed to help increase the production of oil and natural gas. Ensuring new employees are ready for work at Calfrac is a top priority. We have developed customized training programs such as the Calfrac Pump School to ensure we provide the trained and qualified workforce Calfrac customers have come to expect. Calfrac’s Pump School is a standardized field training program that focuses on processes and skills that continually improve safety performance and operational efficiency. 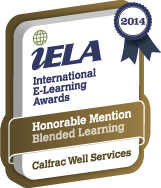 Calfrac's Employee Responsibility Training program is recognized internationally and earned an Honourable Mention for Blended Learning (Business Division, 2014) from the International e-Learning Association. (Safety) stats and low incidents are the most important numbers and I believe that you all believe that also. Thank you for adhering to the guidelines and making everyone safe out there.